The President plans to push Congress to move quickly in the coming months on an ambitious overhaul of the immigration system that would include a path to citizenship for most of the 11 million illegal immigrants in the country, senior administration officials and lawmakers said last week. Antonio Villaraigosa has weighed in with an op-ed in Politico which demonstrates that Democrats can be as dishonest as Republicans. The Los Angeles mayor sets out what he terms "six broad policy pillars" which should form the basis of immigration reform. They are, alas, not six broad policy pillars but rather (respectively): goal, principle, principle, platitude, policy, policy. Villaraigosa begins his list by advocating "a pathway to legal permanent residency and citizenship for the 11 million undocumented immigrants," the goal of what advocates usually refer to as "comprehensive immigration reform." 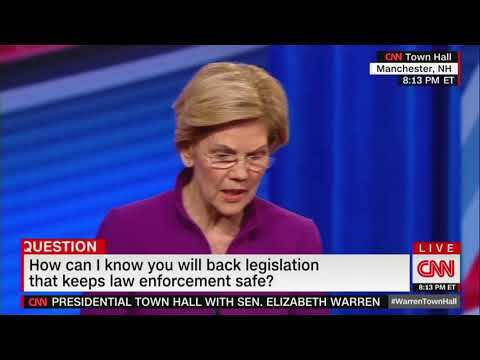 He follows with two principles, that "legalization should be earned, but not unattainable" and "family unification should continue as a key priority." The fourth "policy pillar" is a mere platitude- "the hard work and talent of immigrants fuels our economy"- given that the hard work and talent of native-born citizens also fuels our economy. The mayor's fifth "pillar" is "immigration reform must include an effective and efficient employment verification system" which, if implemented according to the principles he recommends, would be a welcome component of an immigration policy. in the sixth item, however, Villaraigosa argues "we must protect our border through smart enforcement." The tip-off is the adjective "smart," in this case belying a disinterest in enforcement. Villaraigosa notes "today, net undocumented migration is at or below zero" while failing to note that the primary reason is the severe economic slump the nation has gone through. There is no reason to immigrate to the United States in order to remain unemployed and left to its own devices, immigration is likely to increase as the economy recovers. Our immigration policy must expand the avenues for these valued workers to seek legal employment. As the president has suggested, let’s staple a green card to the diplomas of foreign students getting advanced degrees in science, technology, engineering and math. We need to expand the H1-B visa program and, at the same time, we need effective visa programs for agricultural workers and for low-skilled, non-seasonal workers. The pool of S&E-qualified secondary and post-secondary graduates is several times larger than the number of annual job openings. The flow of secondary school students up through the S&E pipeline, when it reaches the labor market, supplies occupations that make up only about a twentieth of all workers. So even if there were deficiencies in students' average science and math performance, such deficiencies would not necessarily deplete the requisite supply of S&E college majors. Even if modal test scores or course-taking was by some measure low, the size of the graduating student body is so large that there would still be a sufficient number of students who test above average and who are fully qualified for the relatively small number of S&E jobs. While improving average math and science education at the K–12 level may be warranted for other reasons, such a strategy may not be the most efficient means of supplying the S&E workforce. 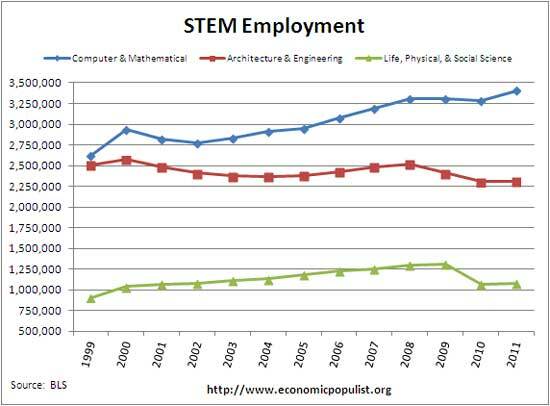 That was reported in 2007 but the problem remains (slightly less so in the T&M leg of STEM). 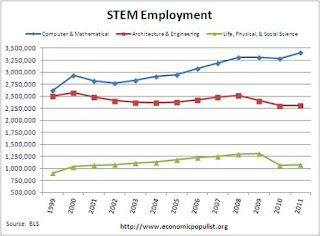 The increase in employment in the Science, Technology, Engineering, and Mathematics field has been minimal over the past decade, as the graph below indicates.The jump in graduates in STEM over the same period has been far greater and actually declined from 2009 to 2011 and the increase in 2011 was dwarfed by the decline in 2010. And that increase was exceeded by the number of STEM H-1B visas, illustrated in the table below, granted that same year. (Graph and table from Robert Oak/The Economic Progressive from BLS statistics.) Educated residents anxious to enter the field, work hard, and keep productivity soaring are readily available while the number of jobs declines. Stop it. Stop it right now. Stop scapegoating the American worker. It's bad enough that Republicans labor overtime to scare Americans about the deficit in order to neglect the creeping destruction of the economy through the elimination of good jobs. The problem is only made more severe when Democrats like Antonio Villaraigosa turn a blind eye to the problem and pursue a larger labor pool, forcing downward pressure on wages and benefits and expanding the gap between the wealthy and the middle class.